The Florence Baptistry (or Florence Baptistery, in Italian Battistero di San Giovanni) is part of the Florence Duomo Complex, which includes the Cathedral of Santa Maria del Fiore with Brunelleschi’s Dome and Santa Reparata Excavation, the Baptistery itself, Giotto’s Bell Tower, and the Museum of the Opera del Duomo. The Baptistery of Florence was consecrated in 1059 and was named after St. John the Baptist (San Giovanni Battista), the patron saint of Florence. The construction of the building began around the fourth century on the ruins of a Roman house. The structure was rebuilt several times, and was then consecrated on November 6, 1059 by Pope Nicholas II, born Gérard de Bourgogne. In 1128 the church became officially the Baptistery of Florence and in the following decades were built the marble covering, the floor of inlaid marble and the dome, completed in mid-thirteenth century. Then were made the mosaics of the apse and the elaborated mosaics of the dome, with the collaboration of Coppo di Marcovaldo and Cimabue. In the thirties of the fourteenth century led to the first of the bronze doors by Andrea Pisano, commissioned by the powerful Arte di Calimala (or Merchants Guild, specializing in the importation of fine fabrics), which had the task of protecting the Baptistery. The second port was built instead by Lorenzo Ghiberti in the first decades of the fifteenth century. He won a contest that was also attended by other famous artists, including Filippo Brunelleschi. The third door, called Gates of Paradise (Porta del Paradiso), is entirely gilded and it was made by Ghiberti as well, in the years 1425-1452. The original door is currently preserved in the Museo dell’Opera del Duomo. For the realization of the two doors of the Baptistry, Lorenzo Ghiberti created a proper workshop of bronze workers, which had as apprentices also Donatello and Michelozzo. The iconography of the three bronze doors depicts, as in a gigantic illustrated Bible, the Old Testament Stories (East Gate), the stories of Saint John the Baptist (South Gate), and the Stories of Christ, or new Testament (North Gate). The doors of the Baptistery, in particular those of the Gate of Heaven, feature a modern and vital sculpture, realized with impressive perspective solutions. 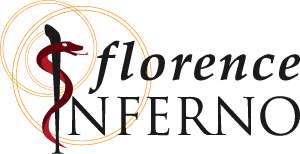 They are a symbol of Florentine Reinassance. On either side of the Gates of Paradise there are two columns of porphyry, donated by the Pisans to the Florentines, for military aid provided to them in 1117 for defense against attacks by Lucca. 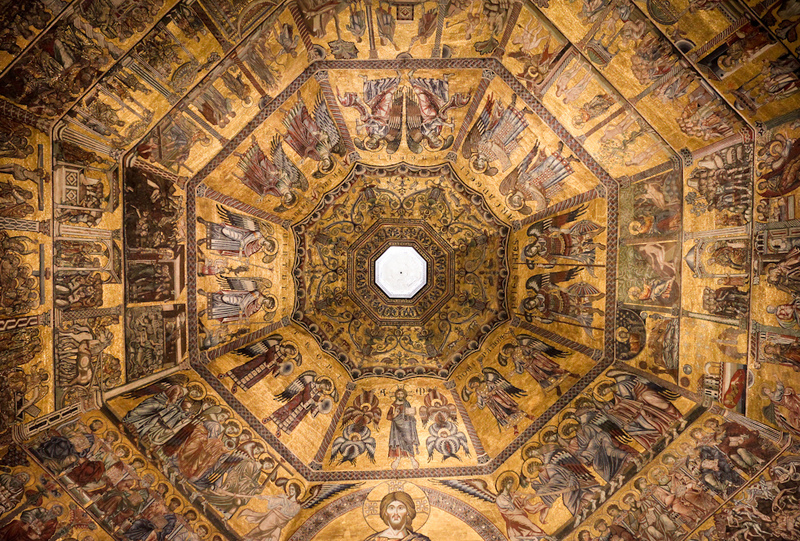 Built in Florentine Romanesque style, the Baptistery has an octagonal plan and is covered by a dome with eight wedges. The outer cladding is made of white Carrara marble and green Prato marble, which create three horizontal bands decorated with geometric panels and round arches. The floor is decorated with beautiful marble inlay, inspired by a fantastic East, with imaginary animals and designs typical of imported fabrics. The altar is in Neo-Romanesque style, and was created in the early twentieth century by the architect Giuseppe Castelluci, who recovered some original fragments. The baptismal font, dated to 1371, is attributed to a follower of Andrea Pisano and is decorated with six marble bas-reliefs depicting drops of baptism. It is flanked by a candelabra and a pair of Gothic fonts attributed to a follower of Arnolfo di Cambio. In front of the altar there is a grating that shows the basements, which are home to the ruins of the ancient Roman building with geometric mosaic floors. The ruins were discovered thanks to a series of excavations carried out at the beginning of the twentieth century. Inside the Baptistery are also two Roman sarcophagi, and some funerary monuments, including one dedicated to Antipope John XXIII, born Baldassarre Cossa, made by Donatello and Michelozzo in the twenties of the fifteenth century. Other art works carried out initially for the Baptistery, such as the wooden Magdalene Penitent (Maddalena Penitente) by Donatello, the silver altar, and the Parato di San Giovanni (panels embroidered with polychrome silk and gold thread, made according to a design by Antonio del Pollaiuolo), are now in the Museo dell’Opera del Duomo. The dome and the apse of the Baptistery of San Giovanni are decorated with impressive golden mosaics. The apse is decorated with images of Christ, the Virgin Mary, the apostles, prophets and angels, accompanied by images of leaves and plants. The mosaics of the dome, arranged in concentric circles, depicting the angelic hierarchies, the stories of Genesis, the story of Joseph, the stories of Virgin Mary and Christ, and finally the stories of St. John the Baptist, and finally the famous Last Judgment, attributed to Coppo di Marcovaldo. The mosaic of the Last Judgement (Giudizio Universale) is dominated by a majestic Christ. At Christ’s right hand there are the rewards of the saved leaving their tomb in joy, and at Christ’s left hand is depicted the punishments of the damned. The Hell scenes are very picturesque and feature a big Satan, along with many tormented demons. 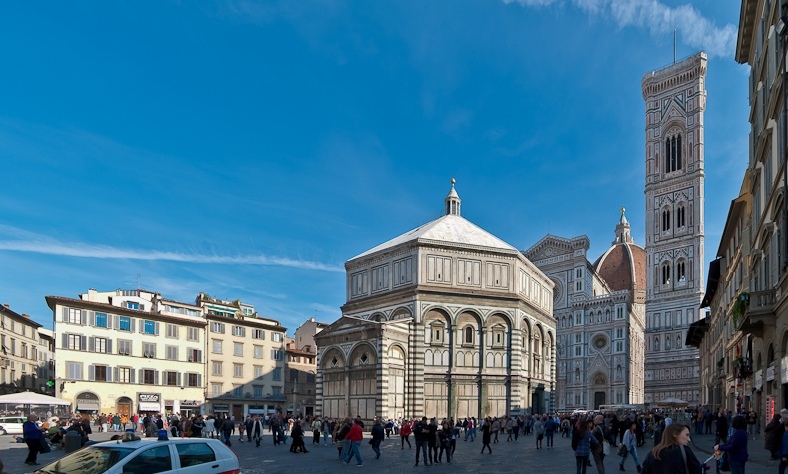 The Inferno tour of Florence includes the guided visit of the San Giovanni Baptistry. Also available private tours.